Surely, this is the most beautiful royal residence and landscape I have ever seen. On the outside, it does not strike as luxurious, and one cannot imagine what awaits inside. 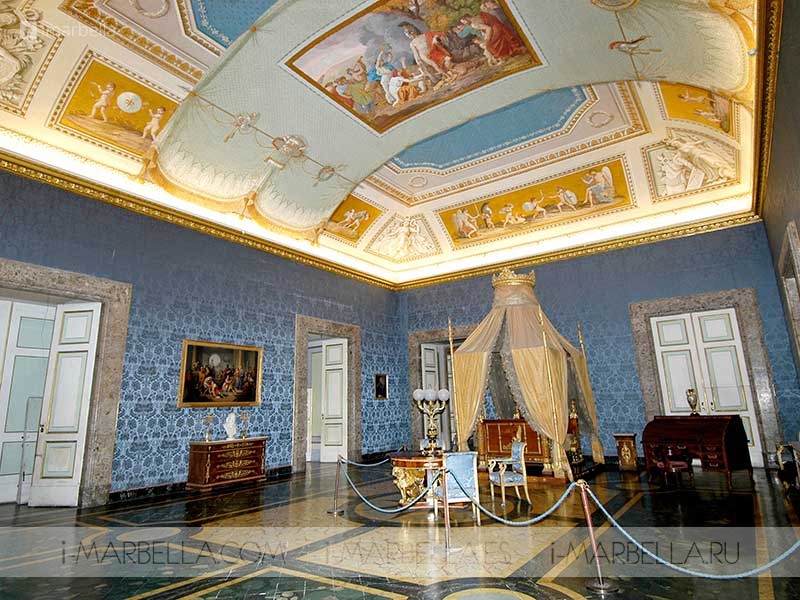 The Royal Palace of Caserta is a former royal residence in Caserta, southern Italy, constructed for the Bourbon kings of Naples. It was the largest palace and one of the largest buildings erected in Europe during the 18th century. 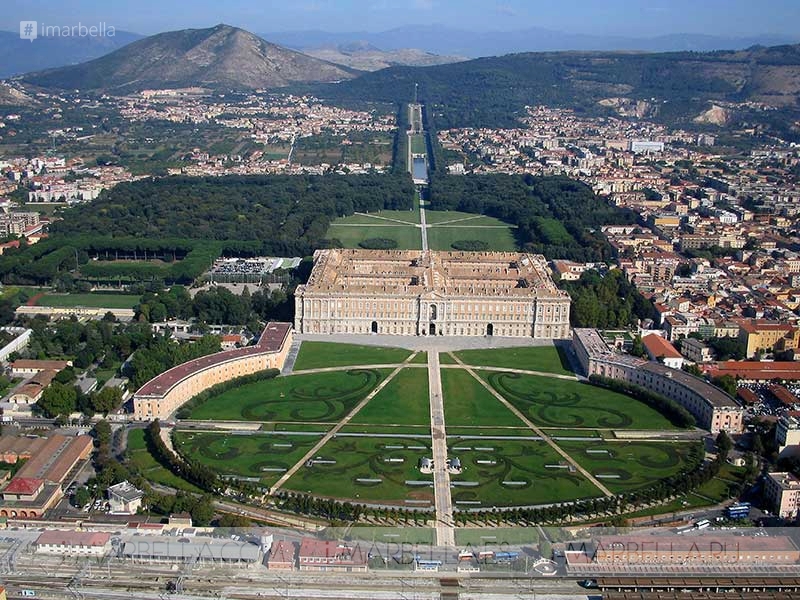 The monumental complex at Caserta, created by the Bourbon king Charles III in the mid-18th century to rival Versailles and the Royal Palace in Madrid, is exceptional for the way in which it brings together a magnificent palace with its park and gardens, as well as natural woodland, hunting lodges and a silk factory. It is an eloquent expression of the Enlightenment in material form, integrated into, rather than imposed on, its natural setting. The Royal Palace is rectangular in plan, with four large interior courtyards intersecting at right angles. It covers 45,000 m2 and its five storeys rise to a height of 36 m. An indication of its scale can be judged from the fact that there are 143 windows on the main facade and the building contains 1,200 rooms and 34 staircases. The building is constructed in brick, the two lower storeys being faced with travertine ashlars. The whole structure is crowned by a central cupola. In front of the main facade is the elliptical parade ground. Inside, there are three octagonal vestibules, aligned on the main axis of the building and acting as fulcrums for the entire complex. The monumental main staircase gives access to the royal apartments, which are decorated and furnished in 18th-century style. The chapel, inspired by that at Versailles, opens out of the lower vestibule. Another noteworthy feature is the Royal Theatre, a superb example of 18th-century design. 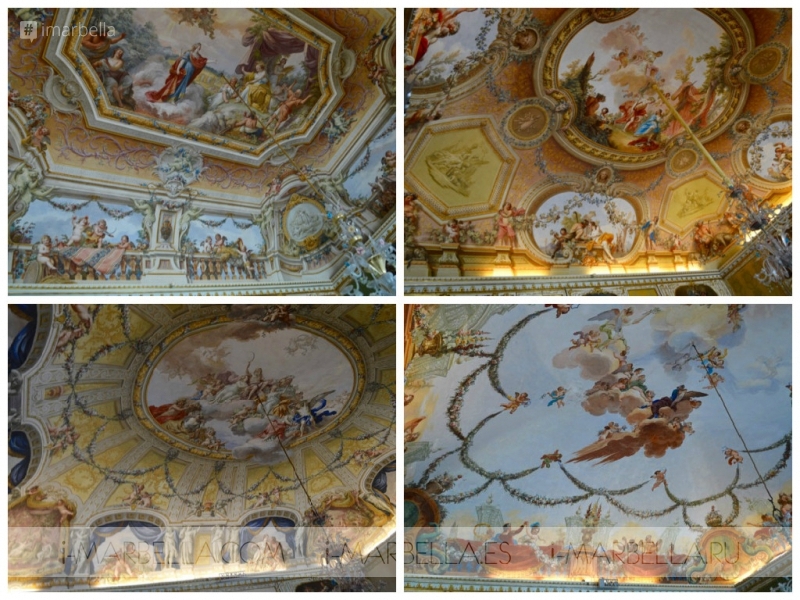 The park, which lies behind the palace, was planned by Luigi Vanvitelli but completed by his son Carlo. The main axis is punctuated by a series of Baroque fountains and stretches of water. This magnificent perspective terminates in the Great Fountain, where water cascades down from a height of 150 m into an ornate basin that depicts Diana bathing, observed by the unfortunate Actaeon. It is always much better to travel around a country with a local, and we were blessed to have Alessandro with us! We are thankful to him for arranging such a wonderful weekend trip. Many thanks to Saeko Hamada as well for inviting us!